Cooking for kids who swear off meat | Mealtime | Kids VT - small people, big ideas! "Why do people eat animals?" The question caught Kids VT designer Brooke Bousquet off guard when the older of her two sons, 5-year-old Noah, posed it during bath time a few months ago. Bousquet scrambled for an answer, rattling off something about protein, and about treating animals well during their lives before they end up on a dinner plate. But Noah wasn't having it. As he teared up, Bousquet, an omnivore, rushed to reassure him that eating animals is a choice — one he could make for himself. "I'm going to stand on the tallest ladder in the world and tell people not to eat meat," Noah told his mother. Months later, he still maintains a vegetarian diet. "It wasn't like we led him down this path," Bousquet says. "He totally chose it." According to a 2009 poll conducted by the Vegetarian Resource Group, an estimated 3 percent of American kids between the ages of 8 and 18 are vegetarian, meaning they don't eat fish, poultry or meat. 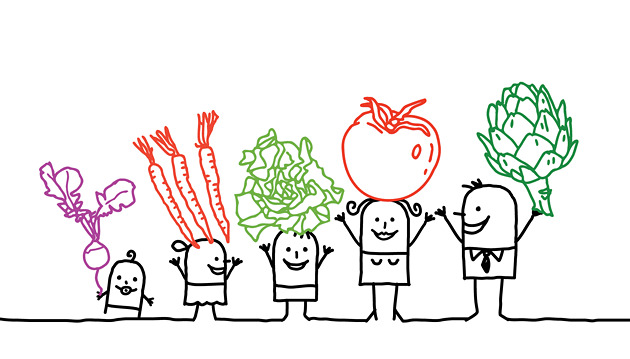 Anecdotally, vegetarian advocacy groups say that choice is on the rise among kids and teens. "You don't have to freak out about it," says Bethany Yon, a research associate in the University of Vermont's department of nutrition and food sciences. She says that if children are still consuming other animal products — such as dairy and eggs — it isn't difficult for them to get the calcium, iron and vitamin D that they need to thrive. And there are perks to going veggie: According to a position paper from the Academy of Nutrition and Dietetics, vegetarian kids consume less cholesterol and saturated and total fat, as well as more fruits, veggies and fiber than their omnivorous peers. Yon suggests parents "gently explore" their child's newfound preferences and discuss ways to approach vegetarianism from a healthy angle. "The big concern sometimes is that it just becomes an excuse to eat carbs all day," she says. Williston mom Nicole Voth knows all about that. Her daughter Olivia went through a "noodletarian" stage when she first cut out meat six years ago. But in the years since, Olivia — now a tall, poised 14-year-old with a passion for cooking — diversified her meals. She became much more serious about "adding color into her diet," as her mother puts it. She saw a nutritionist and started helping out in the neighborhood community garden. For Olivia, the choice to go vegetarian was mostly about personal preference; she didn't care for the taste or texture of meat. "We really didn't have many discussions about it," says Voth, reflecting back on Olivia's decision. "It was a proclamation she made." A mountain of fresh, vibrantly colored vegetables covered the kitchen counter at the Voths' on a recent Saturday night. The family was preparing to whip up an enormous crock of southwestern vegetable soup. Olivia wielded a chef's knife, which she had learned to handle skillfully, and safely, during cooking classes at the Essex Resort & Spa. She chopped up mushrooms, peppers, onions, carrots and parsnips. Her bubbly 8-year-old sister, Zoe, fed them into a food processor. The family worked in cheerful, practiced unison in the kitchen, which was soon filled with the smell of fresh, earthy vegetables. "It's spicy, and it's absolutely nothing but veggies," Voth said of the soup, one of the go-to recipes she used when she had to "hide" vegetables from her two kids. Now the girls embrace them with gusto. The shredded vegetables went into a large soup pot with a bit of butter and olive oil. Olivia stirred the pot occasionally until the veggies softened and began to cook down. Then she added stock and a medley of spices, including Tabasco, cumin and plenty of black pepper. Olivia dipped in a clean spoon to taste. "Too sweet," she pronounced and continued tinkering, with her mother's help. Voth started involving the girls in her cooking early on. She says she didn't want the time she spent preparing meals to exclude her daughters — so into the kitchen they came. In the years since, Olivia has grown increasingly interested in food. For her eighth grade challenge project at Williston Central School, she's writing a cookbook based on her experiences teaching neighborhood children about gardening and cooking last summer. She hopes to sell it and donate the proceeds to her school garden. More often than not, Olivia cooks by feel instead of precise measurements. She's keen on experimentation, which has lead to both big successes and the occasional flop. She won over the neighborhood kids with her rhubarb and honey bars, for example, but didn't have any takers for her spinach pancakes. "I don't know why green is such a terrifying color for kids," she says. Her solution? Put it in a calzone. The teen is the only vegetarian in the Voth household. On that same Saturday night, when the meal was nearly finished, her soup went into a separate pot before Voth added some shredded chicken to the remainder. The family often makes vegetarian-only meals, sometimes because it's simpler than cooking two different dinners. Other times, it's because Olivia is at the helm. "Now that she is older, there are times that I come home and dinner's ready," says Voth. "And that's really special." Meanwhile, at the Bousquets' home, Noah's newfound vegetarian ideals have changed the family's diet — because Bousquet, like Voth, would rather not cook two meals every night. Gone is the local venison that extended family members once provided, as well as those high-quality frozen chicken nuggets Bousquet used to reach for in a pinch. "I was hoping that he would outgrow it," she admits, just like he outgrew the phase during which he wore camo-colored clothing only. No luck. "If anything, he's grown stronger in his convictions." Bousquet jokes that perhaps she should have anticipated her son's gentle-hearted affection for animals. "His name is 'Noah,' for crying out loud."